Tributary Water Quantity - SOTSP. Protect and increase instream flows by limiting consumptive water withdrawals, using the most efficient irrigation methods, preventing soil compaction and riparian vegetation removal and wetland destruction; and, where necessary, restore soil and riparian vegetation and recreate wetlands. Current levels of watershed development and land uses continue to have major impacts that routinely reduce streamflows as described in the 1995 Plan. The same conflicts between in-stream and out-of-stream uses still exist, as well as the antiquated legal means of dealing with water availability detailed extensively by Wilkinson (1992). The science of instream flow evaluation for aquatic uses was developed prior to the 1995 Plan, but instream flows are still frequently not designated for anadromous fish. The ability of the Endangered Species Act (ESA) to achieve its goal of restoring the viability of listed anadromous fish populations depends heavily upon there being water in streams. As long as instream flows sufficient for fish are provided at the discretion of the landowners through whose property a stream flows and without a legal framework to protect aquatic resources, salmon viability will be increasingly threatened. The best in-channel habitat restoration efforts will be useless without sufficient water. A lack of water in the fall season when the salmon typically spawn results in limited spawning area and reduced quality of the habitat available. Currently, these impacts are arising from the combination of increased human use and effects of climate change. Climate change has also been shown to result in earlier spring snowmelt and, consequently, earlier and more extreme summer low flows (Mayer and Naman 2011), especially in snowmelt-dominated streams (Wu et al. 2012), leading to higher summer water temperatures. Actions that slow the flow of water through watersheds and promote more efficient use of water will be essential to ameliorate these changes. Also see Biological Perspective, Habitat of Anadromous Fish in the Columbia River in the 1995 Plan. In the period since the 1995 Plan was released, a significant increase in the understanding of the surface water-groundwater interaction has arisen (e.g., see EPA 2000, Kondolf et al. 2006, Jones et al. 2008, CTIC 2008, Goodrich 2008). Groundwater linked to surface streamflow in a floodplain is termed hyporheic flow (EPA 2000). This surface water-groundwater interaction has implications for both water quantity and quality. Streams can be classified as ephemeral, intermittent or perennial, depending upon the relationship between bed elevations and groundwater elevations on a seasonal basis (Goodrich 2008). Many streams support salmonid rearing on a periodic or a seasonal basis. Groundwater pumping can alter the availability of surface water. Streams that are intermittent and support salmonid rearing in certain years or parts of the year can be dewatered by groundwater pumping, thereby reducing the availability of rearing habitat in a drainage. The same effect can result in impaired stream passage for juveniles and adults by converting a stream reach to a “losing” reach when it is dewatered (Goodrich 2008). Conflicts over water availability increasingly occur today among the agriculture community due to irrigation with a common resource (groundwater and surface water that are fully linked hydrologically). Assumptions still remain that if surface water becomes unavailable, irrigation can still draw upon groundwater. Among groundwater users, the user who can dig the deeper well can be the one who commands water availability. Despite the method used to access water, aquatic resources suffer when sufficient water is not left in the stream. Yet to be developed are new legal mechanisms that provide greater protection for instream flows while safeguarding user interests. Existing tools, such as water leasing, are not always workable, e.g., in orchard agriculture. Existing water law not only fails to give deference to instream flows, but it also fails to provide the flexibility to implement creative solutions, such as user rotations. Watershed partnerships that are based on the premise that all resources can be safeguarded by planned and efficient use of water availability are necessary for the greatest sustainability for combined terrestrial and aquatic resources (CTIC 2008). The tributary water quantity recommendations made in the 1995 Spirit of the Salmon Plan remain relevant and applicable. Monitor status and trend of water quantity (and quality) in selected watersheds as a means to know whether sufficient actions are being taken to protect and restore aquatic resources; provide sufficient funding for watermasters to regulate water consumption to no more than legally permitted; monitoring and flow regulation should take into account interactions among flow and other environmental variables, such as temperature and biotic interactions (e.g., Wenger et al. 2011); land use actions such as floodplain management, allowing stream and floodplain interconnection, road network reduction, and wetland protection are important water quantity protective mechanisms; and focus efforts on instream flow needs for aquatic resources, channel, and floodplain maintenance as data needs for water adjudication procedures. See monitoring recommendations in the Watershed Restoration and Research, Monitoring and Evaluation updates. Implement and adequately fund programs such as the Columbia Basin Water Transactions Program (MacDonnell 2011) that promote innovative local solutions for maintaining and restoring instream flows for fish; promote revisions to water law provisions to facilitate long-term maintenance of instream flows for fish (MacDonnell 2011); and recognize the dependence of streamflow in fish-bearing reaches on the streamflows in non-fish-bearing reaches, thus protecting connectivity among all river reaches to allow for critical fish migration. Ensure water saved to protect fish remains instream and is not simply removed by activating rights of junior water users; and protect instream flows for fish on a stream-system basis that cuts across water control jurisdictions and does not allow benefits gained in one river reach to be undone by uncontrolled regulation downstream. Recognize the tight linkage between groundwater and surface water flow quantity in permitted water consumption: groundwater usage must not be allowed to deplete surface water, while surface return flows from irrigation and other runoff should be used to recharge groundwater. Protect and restore floodplains, wetlands, riparian and upland soils, and upland vegetation that control water quantity and timing of release. Restore natural biota that help maintain floodplains and wetlands directly through ecosystem engineering, e.g., beavers (see Pollock et al. 2004, White and Rahel 2008) or indirectly through trophic cascades (see Ripple and Beschta 2004). Encourage cooperation between landowners, state and federal agencies and tribes that seek protection of fish, wildlife, and ecosystem health in achieving a balance among all land uses that depend upon water availability. Encourage the recognition among landowners that groundwater and surface water users draw their water supply from a common source. 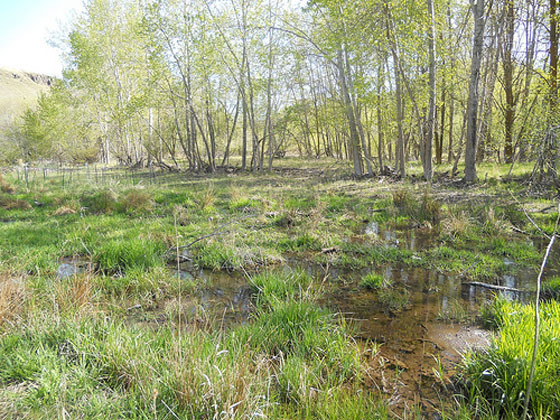 A floodplain created when the Confederated Tribes of the Umatilla Indian Reservation made improvements to Russell Spring Creek, prime steelhead and spring chinook spawning and rearing habitat in the Tucannon subbasin. Recent research shows that channel restoration and reconnection with the floodplain is a means to reestablish surface and subsurface water exchange (hyporheic exchange), which can reduce summer surface water temperatures. Water flows into the floodplain, is absorbed into floodplain soil and gravels, and returns to the stream as cool water. In addition to cooling stream water temperatures, hyporheic exchange recharges groundwater supplies, which leads to more sustained instream flows.